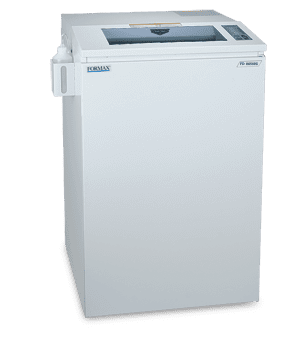 The Formax FD 8300HS High Security Deskside Shredder offers Level 6 Security in a compact, rugged design that fits right under a desk to shred “Top Secret” or classified documents. An easy-to-use LED control panel puts the power right at your fingertips, and commercial-grade components ensure durability. This cross-cut model can shred up to 8 sheets at once, up to 23 feet per minute, with a shred size of 1/32” x 3/16”. It has been evaluated by the NSA and meets the requirements of NSA/CSS specification 02-01 for Level 6 high security cross-cut shredders. In addition, the ECO Mode saves energy by automatically switching into standby mode after 5 minutes of inactivity. Commercial-grade features include heat-treated steel blades, a steel cabinet, lifetime guaranteed waste bin, and a powerful AC geared-motor. The optional EvenFlow™ Automatic Internal Oiling System helps to keep the FD 8300HS in peak operation. 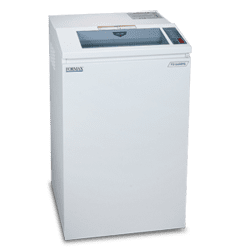 Formax FD 8400HS High Security Office Shredders offer Level 6 Security with a 16 feed opening, combined with commercial-grade components in a sleek, practical design. Formax FD 8400HS-1 High Security Office Shredders offer Level 6 security with commercial-grade components in a sleek, practical design. An easy-to-use LED control panel puts the power right at your fingertips. The FD 8400HS-1 shreds up to 7 sheets at once, up to 23 feet per minute, with a shred size of 1/32" x 3/16". 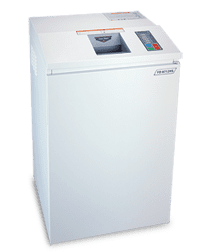 The FD 8400HS-1 has been evaluated by the NSA and meets the requirements of NSA/CSS specification 02-01 for Level 6 high security cross cut shredders. The EvenFlow™ Automatic Oiling System is standard on the FD 8400HS-1, and periodically lubricates the cutting blades based on motor run time, keeping the shredder in peak operating condition. In addition, the new ECO mode saves energy by automatically switching into standby mode after 5 minutes of inactivity. 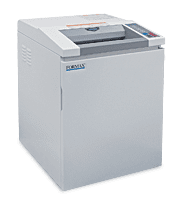 Formax FD 8500HS High Security Office Shredders offer Level 6 Security with a 16" feed opening combined with commercial-grade components in a sleek, practical design. An easy-to-use LED control panel puts the power right at your fingertips. The FD 8500HS Cross-Cut model can shred up to 5 sheets at a time, up to 35 feet per minute, with a shred size of 1/32" x 3/16". 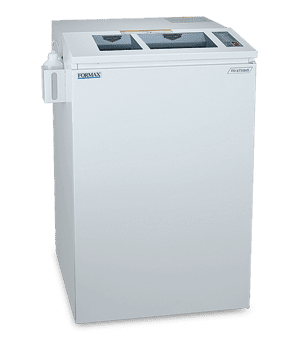 The FD 8500HS has been evaluated by the NSA and meets the requirements of NSA/CSS specification 02-01 for Level 6 high security cross cut shredders. In addition, the new ECO mode saves energy by automatically switching into standby mode after 5 minutes of inactivity. The optional EvenFlow™ Automatic Oiling System periodically lubricates the cutting blades based on motor run time, keeping the shredder in peak operating condition. 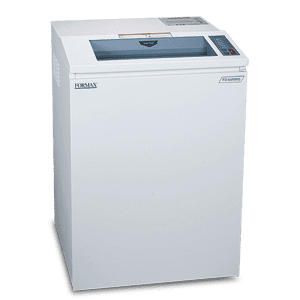 Formax FD 8650HS High Security Office Shredders offers Level 6 Security, with an automatic oiler that oils the cutting blades periodically for optimal performance. The FD 8650HS is an office size shredder with industrial strength, and shreds up to 15 sheets at once, up to 24 feet per minute, with a shred size of 1/32” x 3/16”. Evaluated by the NSA, it meets the requirements of NSA/CSS specification 02-01 for Level 6 high security cross cut shredders. The extra wide feed opening handles documents up to 16” wide and the large waste bin holds up to 53 gallons. In addition, the ECO Mode saves energy by automatically switching into standby mode after 5 minutes of inactivity. The FD 8712HS High Security Optical Media Shredder meets the requirements of NSA/CSS Specification for Optical Media Destruction Devices. This shredder is the perfect solution for top secret and classified destruction of Optical Media including CD-ROM, CD-R, CD-RW and DVDs. The cutting system shreds up to 1,068 disks per hour into 1/16" x 5/32" particles. Standard features include an all-metal cabinet with casters, steel gearing, lifetime guaranteed waste bin, and an easy-to-use control panel with digital load indicator. In addition, the ECO Mode saves energy by automatically switching into standby mode after 5 minutes of inactivity. The EvenFlow™ Automatic Internal Oiling System is an available option, which lubricates the cutting blades automatically during use to keep them in peak operating condition.